4WheelParts: Find Jeep Parts Online OR In Their Stores! 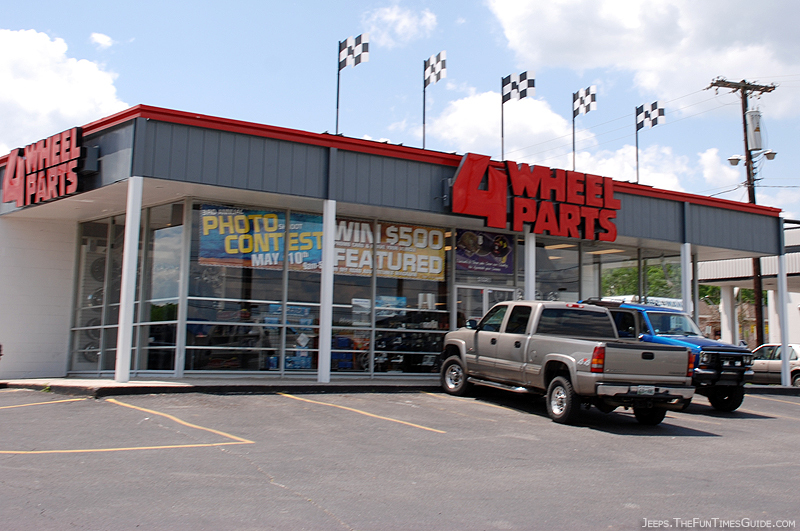 Did you know that 4WheelParts has actual stores where you can actually walk in and look around? Yep, these brick & mortar locations are in addition to their online store. 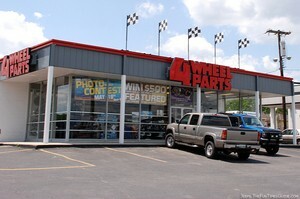 We just so happen to live a couple miles from the 4WheelParts store in Nashville. We checked it out for the first time last week. We were in the market for a lift kit, tires, and wheels for our Wrangler Unlimited. We feel so fortunate to have a Jeep-friendly parts store located so near us. The minute we walked in, we felt like kids in a candy store. They don’t have all that much on display in these stores, but they definitely have enough to whet your appetite and make you want to buy something! And they had all of the basics covered: tires, wheels, winches, tire covers, lights, and of course… Jeep T-shirts & memorabilia. The rest would be ordered & shipped from one of their warehouses, as needed. We really liked how knowledgeable the workers there were. Specifically with Jeeps, too. That was comforting, because I had a lot of questions about this lift kit we were about to buy — especially when I wasn’t 100% sure I even wanted one! Plus, when pricing tires, for example, we told them basically what we wanted, then they’d tell us: (a) what they would buy, if it were them; and (b) the next best one — that was usually a bit cheaper. Finally, we were glad to see that they have a professional team of installers on site who can install whatever it is that you order from 4WheelParts. In our case, they said they could have our Jeep lift kit installed in less than a day, but they wanted to keep our Jeep overnight so they could take some time to run the Jeep through its paces and make sure everything was perfect after they installed the suspension (…and tires and wheels). Stay up to date with what's happening on The Jeep Guide. From Jeep Wrangler Soft Top & Hard Top Issues to Accessories and Offroading tips for all Jeep makes & models... you'll always be the first to see these helpful tips as soon as we publish a new article.